I'm very much a creature of habit when it comes to my makeup. Even though I've got drawers of blushes and lipsticks and eyeshadow palettes and foundations, I basically wear the same things every day for MONTHS and then I'll introduce something new and that will be used every day for months until something else new comes in and so the cycle continues. 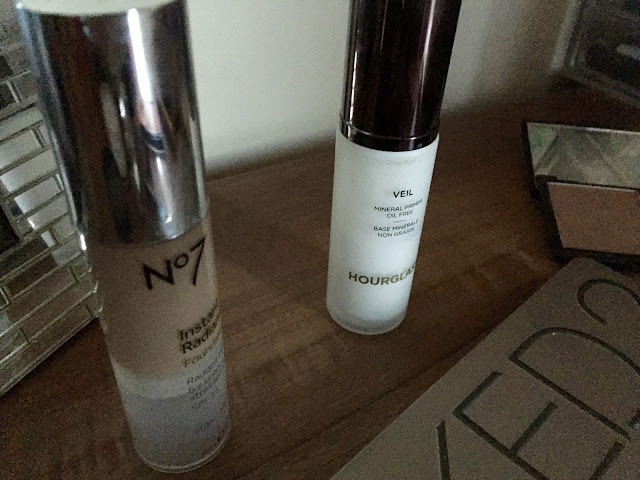 The Hourglass Mineral Veil primer is my favourite at the moment, it leaves my skin feeling really smoothed out and is the ideal base for foundation. My foundation of choice is No7 Instant Radiance and has been the same for quite a while now. This is actually my 3rd repurchase which almost never happens! I absolutely love this, it makes my skin look really glowy without being shiny or greasy, and it lasts all day without sinking into my pores. Definitely a keeper! For my under-eyes I use the YSL Touche Eclat which gives a lovely highlight. If I need to cover up any blemishes I'll use my trusty Collection Lasting Perfection concealer (not pictured). For blush I tend to reach for my Sleek Blush by 3 palette every day, with Crochet (a lovely peach) being my most used shade by far. Sleek blushes are great, really pigmented and they last ages. 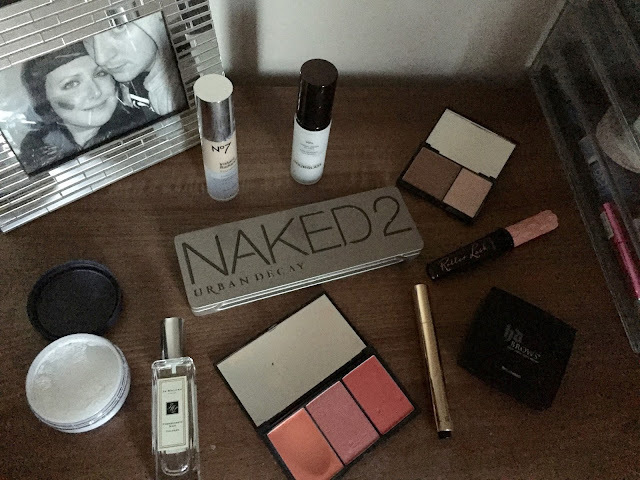 I set my makeup with the By Terry Hyaluronic Hydra-Powder which keeps everything in place all day and stops me getting shiny (I used it on my wedding day and it worked a treat!). I love how soft this leaves my skin, I can't stop stroking my face after I've used it! 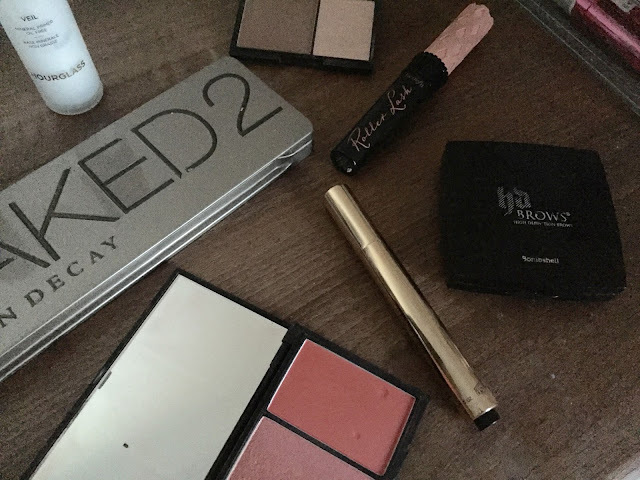 For my eyebrows I tend to use the HD Brows palette, usually setting in place with the Sleek Brow Perfector (not pictured). I've recently been falling back in love with the Naked 2 palette as you can use it to create so many different looks. In this instance I used Tease on the lids with a bit of Snakebite near my lash line. Another favourite is Suspect which has a lovely shimmer to it. My absolute fave was YDK but that's long been used up unfortunately. For my lashes I have been loving Benefit's Roller Lash - currently on my 2nd repurchase. I much prefer this to They're Real as it gives a lovely curl and doesn't feel as drying. My lip products are the ones I get the most use out of as I tend to choose a different one every day. On this occasion I used the No7 High Shine Lip Crayon in Petal (not pictured) which is a great everyday colour and feels quite hydrating. 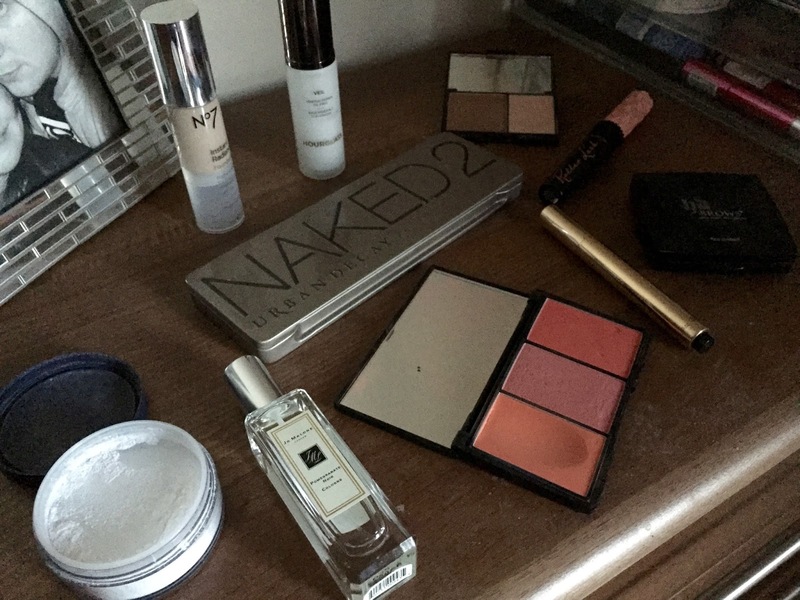 Are of these products part of your daily routine too?